FLORAL is a non-profit organization that consists entirely of volunteers who just happen to be interested in enhancing dog owners’ lives and are willing to take a leadership role in voicing dog owners’ needs to appropriate channels. Everyone is welcome to join and be active! Who are members of FLORAL? FLORAL considers all dog owners who use the southern end of Riverside Park and the 72nd Street Dog Run as members. Who maintains the 72nd Street Dog Run? 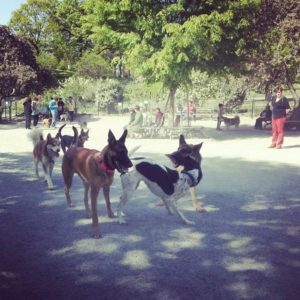 The 72nd Street Dog Run is ENTIRELY maintained by volunteers and contributions. The City does NOT maintain the run in ANY WAY. We depend on ALL USERS to help maintain our facility and keep it clean and neat. You can help by picking up any “stray” poop or by emptying garbage cans, and raking wet hay for speedy drying. How come the City doesn’t maintain the 72nd Street Dog Run? The Parks Department has neither funding nor staff to maintain ALL facilities in city parks. In fact many other facilities in Riverside Park are privately funded and maintained by special interest groups. Become a volunteer and/or make financial contributions. Remember, if you see someone working at the run, keep in mind that is your unpaid and overworked neighbor and fellow dog owner. Offer your help! You can also make a donation by mail or online. Either way please make certain to write “FLORAL” or “72nd St Dog Run” on your check or online contribution or your money will be put in the general Riverside Park Fund. Your donation to FLORAL is tax-deductable as permitted by law! Be sure to indicate FLORAL/Dog Run 72. Click here to donate online. Be sure to indicate FLORAL/Dog Run 72. Donations to FLORAL through the Riverside Park Fund, a 501(c)3 organization, are fully tax deductible. PLEASE BE SURE TO DESIGNATE FLORAL IN YOUR DONATION. FLORAL is a non-profit organization that consists entirely of volunteers who just happen to be interested in enhancing dog owners' lives and are willing to take a leadership role in voicing dog owners' needs to appropriate channels. Everyone is welcome to join and be active! Dog Run 72 relies on donations from you! Click here to donate today!